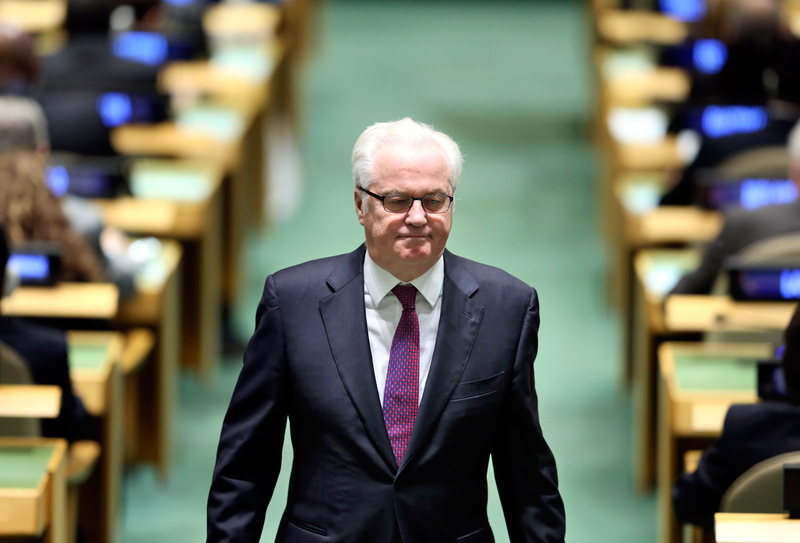 Russian Ambassador to the United Nations Vitaly Churkin died on Feb. 20 in New York. Russian President Vladimir Putin has described Russia’s UN envoy Vitaly Churkin, who died in New York on Feb. 20 at 64 years of age, as one of the most prominent diplomats who brilliantly coped with his tasks and never suffered defeats. Putin’s message addressed to the diplomat’s widow Irina Churkina and his children, Anastasiya and Maksim, was published on the Kremlin’s website on Feb. 21. "Please accept the deepest condolences over the death of your husband and father. His premature demise is the gravest and truly irrecoverable loss for Russia’s foreign policy. It was sudden and this makes the grief over the loss so acute," Putin said. He pointed out that Churkin "without an exaggeration was one of the most outstanding diplomats," a professional of the highest level, a man of profound intellect and remarkable energy, a person of great charm and sense of humor, "who enjoyed his colleague’s sincere respect and tremendous authority with his foreign partners." Putin said Churkin’s achievements in different high-ranking jobs at the Foreign Ministry’s central staff and abroad were hard to overestimate, "but his capabilities were displayed most brightly when he was Russia’s ambassador to the United Nations." "For more than ten years, sometimes in the most strenuous conditions he firmly and systematically pressed for Russia’s stance on the most important world issues, which required immense efforts and complete self-sacrifice. However hard the tasks were, he brilliantly coped with them and never suffered defeats," Putin said. "Churkin was a true patriot and citizen. Bright memories of this man will live on in the hearts of all those who knew him," Putin said. Vitaly Churkin died on Feb. 20, one day before his 65th birthday. Starting from April 2006 he was Russia’s ambassador to the United Nations in New York and Russia’s representative in the UN Security Council. Churkin died at his office desk, the Russian Foreign Ministry said.